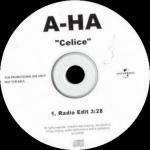 The first single "Celice" from a-ha's album "Analogue" was released in Germany and Norway on 7 October 2005 and in Sweden on 24 October. The cover is white with an arty drawing of a key which is covered by silver, red and black arty patterns plus some lyrics from the song. The a-ha logo is printed in large red letters above the key with "Celice" in black above "Celice" is also printed in large silver ornate letters across the middle. The inside of the insert is silver and white with Celice lyrics the track list on the left hand side and tour dates on the right. This text is surrounded by silver and white leafy art designs. The reverse of the insert features a shot of the band (Paul, Morten, Magne) with the track list more grey, red and white graphics in the bottom left hand corner. The spine is silver with black and white text. The graphics on the disc are similar to the front sleeve, but without the large grey "Celice" across the middle. The CD features 3 different versions of "Celice": Radio Cut (3:28) / Live at Frognerparken (the listed track time is 5:47, but the actual time is 4:43) / Paul van Dyk's Radio Edit (4:04) plus the new song "The Summers Of Our Youth" (3:56) and the video for "Celice" (3:42). This version is available in both Germany and Norway, but the German edition comes with a red sticker on the cover which says "plus exclusive a-ha desktopplayer with videoclip "Celice" & picture gallery". A two track single was also available in Norway, it features the "Radio Cut" and the "Thomas Schumacher Remix" (7:53) of "Celice". The cover design and disc are similar to the 4-track release, but the single comes in a card sleeve. This edition of the single was also available in Sweden. There was also a remixes CD available in Germany which has a similar sleeve to the regular release, but the background is silver (instead of white) and the patterns and "Celice" are in white (rather than silver). 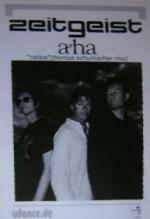 "The Remixes" is printed in white underneath the title above the a-ha-logo. The red sticker on the front says "Incl remixes from Thomas Schumacher, Paul & Boris Dlugosch". The inside of the insert is very similar to the regular release. The reverse of the insert is also similar, but, although from the same photo shoot, the band picture differs slightly. The disc is also similar to the regular release, but features slightly more red in place of the silver. The CD includes 5 mixes of "Celice": Radio Cut (3:28), Thomas Schumacher Remix (7:53), Boris Dlugosch Remix (6:38), Paul van Dyk's Extended Mix (5:42), Paul van Dyk's Vocalized Clubmix (8:07). The German 2 track single has a similar cover to the regular release, but has yellow borders around the text and picture. It also has "SINGLE PUR 2 TRACKS Auch erhältlich als CD-MAXI" printed in the top left corner and "2 Tracks" printed in the other corners. The insert is one sided and has track details plus more of the yellow borders on the reverse. 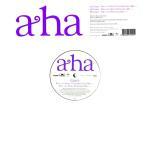 The disc is white with the a-ha logo and track information in black plus the text "SINGLE PUR" with a yellow outline and a single yellow line underneath the track list. The CD features the "Radio Cut" and "Live at Frognerparken" versions of "Celice". The radio 1-track promo of "Celice" features the "radio cut" (3:28). The single comes in a thin plastic sleeve without a picture insert. Due to the late arrival of factory printed promos from Germany, Universal Norway made copies for important press, TV and radio contacts. These CD-Rs (Kodak discs) have been printed using in-house ink printers. The new a-ha-logo and title are printed at the top of the disc with the Universal logo on the right hand side and the text "(radio cut 03:28min) Not For Sale - For Promotion Only" printed at the bottom of the disc. The promo doesn't have a catalogue number. There is a "Radio Broadcasting Promo Only" CD which comes in a paper sleeve. The title is printed in black at the top with a "Radio Broadcasting Promo Only" banner across the middle The four tracks are listed underneath: Celice (Radio Cut) (3:33), Celice (Live at Frognerparken) (4:44), Celice (Paul Van Dyks Radio Edit) (4:01), The Summers Of Ours Youth (3:58) [note the typo in track name]. The disc is a yellow CD-R with "PROMO ONLY" at the top and "Private use only Not for resale" at the bottom. The catalogue number and "Limited edition promo CD" are also printed on the disc. There is a 2-track German promo CD with remixes by Thomas Schuhmacher (3:22) and Boris Dlugosch (3:52). The CD comes in a slimline case with a white paper insert. 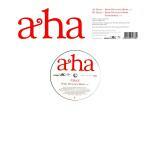 The front of the insert has a-ha, the tracks and record company logos printed in black. The reverse has the track list and copyright details. The disc is silver with black titles. There were three 12" vinyls released in Germany. The first was released on 19 September and features two "Thomas Schumacher" mixes of "Celice", a "Remix" (7:53) and a Dubmix (7:53). The cover is white with a cut-out centre. Along the top is a large sticker (approx. 7cm x 25 cm) with the a-ha-logo printed in large light blue letters on the left side and track information in blue and black on the right. The record label on the A-side is white with a large blue a-ha-logo in the top half of the label and track information in blue and black below. 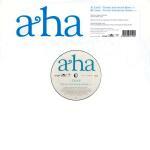 The label on the B-side is blue with a white a-ha logo at the top and white and black track information below. Some of the promotional copies of the12" come with a promo sheet which features a picture of the band (Paul, Morten, Magne) plus the text "zeitgeist a-ha" above. The second 12" vinyl was released on 14 October and the third on 24 October (?). The second 12" features Paul van Dyk Remixes (Vocalized Club Mix (8:07), Extended Mix (5:42) and Clubmix (8:07)). The record labels and stickers on the sleeve are very simialar to the Thomas Schumacher 12", but purple replaces the blue. Note that one side of this 12" plays at 45rpm and the other side plays at 33rpm (the side with 2 tracks). The third 12" features Boris Dlugosch Remixes of "Celice" (Boris Duglosch Remix (6:38), Boris Duglosch Remix Instrumental (6:38)). In this case, the sticker and record labels are red and white rather than blue and white. A 1-track promo CD was available in Australia. It doesn't have a sleeve, but some copies come with a Universal insert with information about a-ha and their new releases. The disc is very similar to the cover of the regular German / Norwegian release, complete with large grey "Celice" title. Underneath the title the following text has been printed "...Taken from the new album Analogue in store November 13". This 1-track 'promo' seems to be unofficial. It comes with a white folded paper insert with artwork similar to the regular European release and with a barcode at the bottom. It has promotional text printed to the left of the cover art. The disc sticker has a poorly printed colour shot of the band with the catalogue of the regular Norwegian 2-track CD printed in white, title in white, promotional text in red plus claims to be on the "SABAM" / "Universal" label. Denmark: A 6 track DJ promo CD featuring the following mixes of Celice was released in Denmark: Radio Cut / Paul Van Dyk Radio Edit / Thomas Schumacher Remix / Boris Dlugosch Remix / Paul Van Dyk Extended Mix / Paul Van Dyk Vocalized Club Mix. The disc comes in a standard black Universal card wallet sleeve with the tracks listed on a white sticker. There is a 1-track French promo single of "Celice" which comes in a jewel case with white paper insert with "a-ha "Celice" 3'28" printed in black. 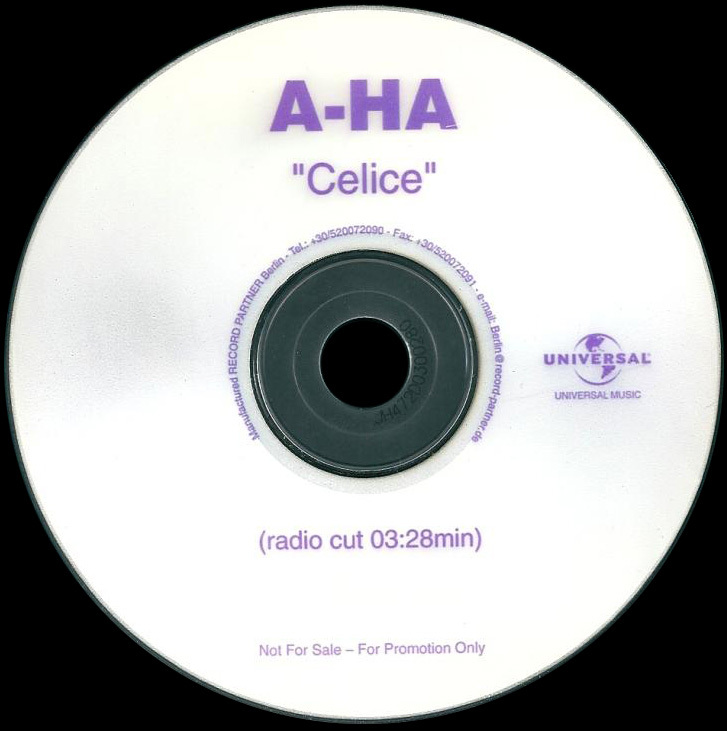 The disc looks like a regular CD-R with the a-ha logo plus "Celice" and 3'28 printed in black at the top and record label logos at the bottom. 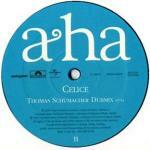 There is a one track German promo CD of "Celice". The disc is silver with purple text. It features the "Radio Cut" (3:28). The German / Norwegian release was available in Israel, but has a printed sticker on the front. There is a 1-track Italian promo of "Celice". 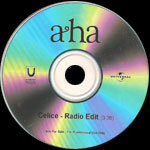 It comes in a jewelcase with paper front insert with a large black "a-ha" logo and "Celice" title on the front and track information on the reverse. 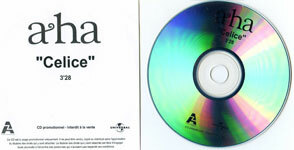 The disc is plain with the a-ha logo and title printed in black. "Not For Sale - For Promotion Only" is printed at the bottom of the disc with German manufature details around the centre. This promo only 1-track CD features the "radio edit" of "Celice" (3:28). The disc is white with black titles and the text "For promotional use only not for sale" on the left hand side. There is a 1-track promo CD single of "Celice" which doesn't come with a cover. The disc is silver with black text and has "For Promotional Use Only - Not For Sale" printed at the bottom. It features the radio cut (3:28). There is an "Ukranian Records" promotional CD-R of "Celice" which comes without a sleeve(?). 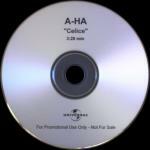 The disc features the a-ha logo in large black letters at the top with the title and text "Not For Sale - For Promotional Use Only" at the bottom. The Universal logo is printed on the right hand side and the Ukranian Records logo on the left. 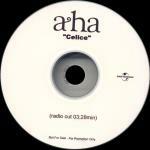 The disc features the "Radio Edit" (3:28) of "Celice".